Alina Karaman is the perfect solution to your wedding hair and bridal makeup. 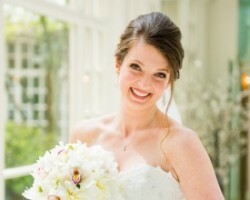 She is an expert in both and is also able to extend her services to the bridesmaids and the mother of the bride. Alina’s work has been showcased on red carpets and television for many years and she now has the skills and talent necessary to create any look that you have dreamed of having on your wedding day. Experience the highly personalized services of Alina for yourself. 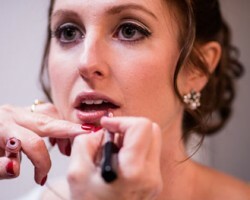 While you will certainly be drawn in by Dawn Newsome’s amazing portfolio and her reviews from previous brides that are filled with praise, it is her straightforward and affordable prices that make her the best option of makeup artist in Washington, D.C. Being able to see exactly how much each one of her services costs means that you can easily budget for the talents of Dawn and ensure that you are getting everything you want to guarantee you look absolutely stunning on the most important day of your life. There are very few areas of the beauty industry that Kim Giammaria hasn’t worked in and she has assisted women in looking their best for commercial shoots, various modeling projects and, of course, brides on their wedding day. Since 1992 Kim has been traveling to venues throughout D.C. and the surrounding areas offering her highly professional services. Previous brides always mention that Kim’s work isn’t just amazing but she also has a calming effect that is a priceless extra amidst the chaos of wedding preparations. As soon as Marti Wright decided to found Tica Beauty this service was on its way to being one of the best in the state. The reason that this company has been such a success is due to the dedication to their clients. This is especially the case when it comes to wedding hair and makeup. Every detail of your look will be carefully crafted to enhance all of your natural beauty. As they use Marti’s own line of cosmetics the look will last so long it will seem like it was permanent makeup. The wedding portfolio of Creative Images is a collection of some of the most incredible looks in the industry. Clarissa, the owner of this service, founded the company in 2006 as she found there was not a consistent quality amongst Washington, D.C. makeup artists. She has since provided on location beauty services to a whole range of brides and each one has felt like Clarissa and her team were fully dedicated to making the client feel comfortable and look incredible.